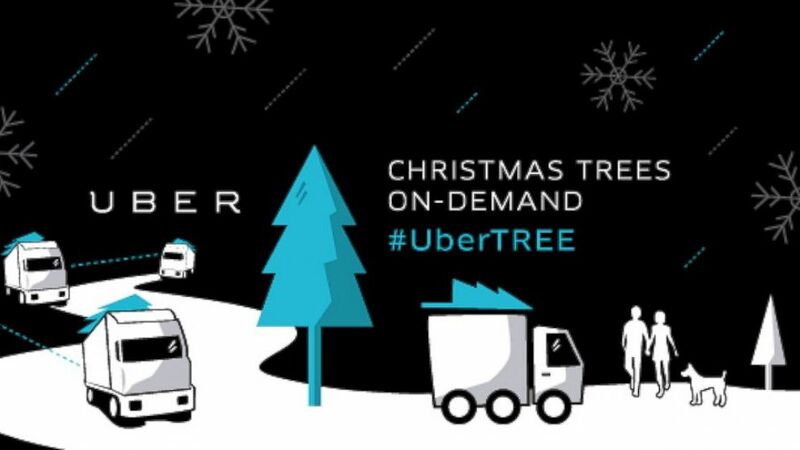 In its latest marketing move, Uber will bring you a Christmas tree. camera (Uber) The car-hiring service Uber, with the help of Home Depot, will deliver Christmas trees to Uber members for $135. Driving to a Christmas tree shop, picking out the perfect fir, strapping it to the hood of the car -- it all sounds so traditional. But ordering a Christmas tree with a tap of your phone? Now, that sounds a lot more like the future. Today, and today only, Uber, the on-demand taxi service, is offering an on-demand Christmas tree service. If you live in a select few cities, you can launch the Uber app on your iPhone, Android phone or BlackBerry and select the "UberTree" option. With the help of Home Depot, Uber will allow you to buy either a $135 7- 8 foot Fraser or Noble fir. They will then deliver it right to your doorstep. However, like many of Uber's former marketing events, there are some big limitations. First, Uber says that tree "availability will be very limited." Then the service is only available in 10 cities, including Atlanta, Boston, Chicago, Dallas, New York City and San Francisco. Uber provides the full list of cities here. When we tried to pull up the option in NYC, we were unsuccessful and the app continued to look for the option. If you live in one of those locations and have more luck, you can place your tree order between 11 a.m. and 8 p.m. today. Of course, once the tree arrives you'll have to figure out where to put it, how to get the star on the top and cram all the presents underneath. There's no app for that yet.